The video that Monika Shail shared on social media had her blowing a 'flying kiss' during India-Sri Lanka 2nd ODI played at Punjab Cricket Association Stadium, Mohali on December 13, 2017, and was part of the live television feed. 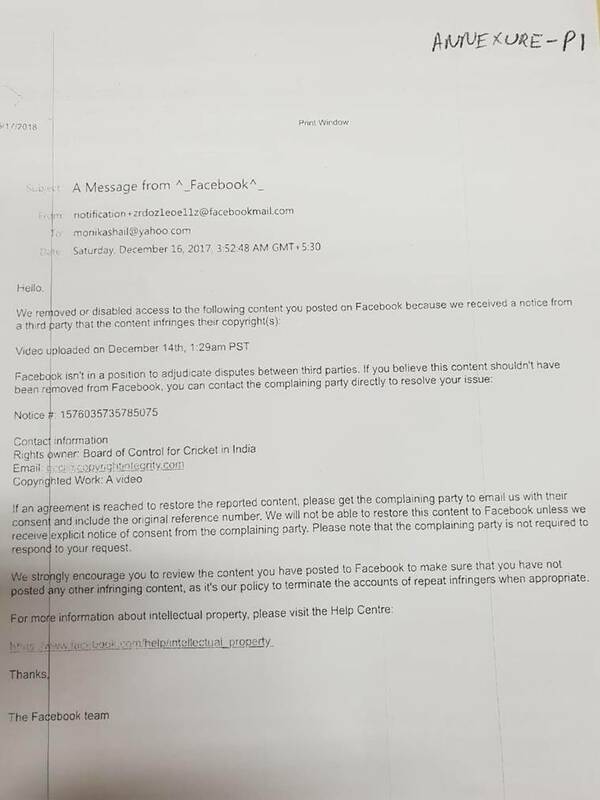 A Chandigarh-based woman, Monika Shail, has approached the district court after Facebook deactivated her account for posting content that purportedly infringed BCCI’s copyright. The video that Shail shared on social media had her blowing a ‘flying kiss’ during the India-Sri Lanka second ODI played at Punjab Cricket Association Stadium, Mohali on December 13, 2017, and was part of the live television feed. Facebook pulled down the clip a couple of days after it was posted and informed Shail about it. “We removed or disabled access to the following content you posted on Facebook because we received a notice from a third party that the content infringes their copyright(s). Video uploaded on December 14th, 1.29 am PST. Facebook isn’t in a position to adjudicate disputes between third parties. If you believe this content should not have been removed from Facebook, you can contact the complaining party directly to resolve your issue. Contact information rights owner – Board of Control for Cricket in India.”, Facebook in an email informed Shail. It further adds, “If an agreement is reached to restore the reported content, please get the complaining party to email us with their consent and include the original reference number. We will not be able to restore this content to Facebook unless we receive explicit notice of consent from the complainant party. Please note that the complaining party is not required to respond to your request. We strongly encourage you to review the content you have posted to Facebook to make sure that you have not posted any other infringing content, as it is our policy to terminate the accounts of repeat infringers when appropriate”. Later on January 25, 2018, Facebook informed Shail that her account was deactivated. Meanwhile, Shail’s apologies to BCCI went unanswered. Speaking to The Indian Express, a top BCCI official said that he was not authorised to comment on the specific issue but did say that they have hired an agency that keeps an eye on objectionable content on social media and takes action to protect BCCI’s copyright. In her petition, Shail says that she has been running her business through her Facebook page and had over 400 friends and around 8500 followers. Facebook India in its reply to the court said, “Facebook India is neither a necessary nor a proper party and the suit should, therefore, be dismissed against Facebook India…” It added, “Facebook is not responsible for hosting any content that may appear on the Facebook Service and does not own or operate the servers, Facebook India was not responsible for hosting the content of complainant…”. BCCI is yet to file its reply. The next date of case’s hearing is scheduled November 30. Shail’s advocate Rajesh Sharma told The Indian Express that “since Facebook had removed the video content from her account, they cannot block or deactivate her account.” The case is being heard by Civil Judge (Senior Division) Barjinder Pal Singh.